The Scandal the White House Feared Most WASN'T Whitewater...It was Mena. The Wall Street Journal called Barry Seal "the ghost haunting the Whitewater probe." Based on a 3-year long investigation, Daniel Hopsicker discovered the 'secret history' the American Press was afraid to tell: Seal, the most successful drug smuggler in American history, was also-and not coincidentally-a lifelong CIA agent, one of the most famous who ever lived, active in everything from the Bay of Pigs... to Watergate...to the Kennedy Assassination. The story of Barry Seal is America's secret history... of what happens when guys we pay to protect us--CIA guys--go into business with guys we're paying them to protect us against.."Made" guys. Mobsters...Organized Crime. While Attorney General of Arkansas, Bill Clinton signed a "get-out-of-jail-free" personal recognizance bond for Barry Seal, after Seal had been jailed for drug smuggling in Mena...in the '70's. The suspicious and long-lasting link between 'smuggler' Barry Seal and the Bush Family, Senior and Junior. 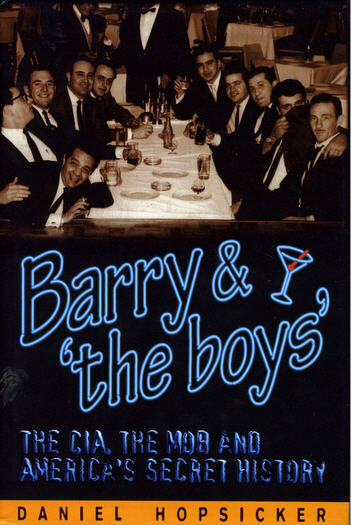 Why a photograph taken in a Mexico City night club ten months before the JFK assassination, (see cover) showing Seal, future Watergate burglar Frank Sturgis, and CIA agent & professional assassin Felix Rodriguez, exposes the secret CIA involvement that explains why Bill Clinton's Arkansas became an openly-corrupt international guns-and-drug bazaar 20 years later. Commenting on the CIA's affair with the Mafia, L.B.J. 's press secretary, Bill Moyers said, "Once we decide that anything goes, anything can come home to haunt us." After you've read "Barry and 'the boys'" you'll understand what he meant. The author was the Executive Producer of a business news show airing on NBC when, while shooting a feature story in Arkansas during production of the pilot for a new show he became aware that, in the words of one top federal law enforcement official, "Things ain't always been jes' right 'round here."